Sadly, #AppleWeek is coming to a close. I hope you've enjoyed all the amazing apple recipes that have been shared! I've had a great time participating and look forward to more events in the future. We are huge fans of traditional shortcake. I was very excited to see this fall spin on it. I made no changes at all to the recipe, and my shortcakes baked in 19 minutes. I added a drizzle of caramel to my serving, the guys enjoyed theirs with whipped cream. Thank you so much to the Taste of Home Test Kitchen for this amazing new family favorite! I know, I don't normally share my knitting here, but this fit perfectly into #AppleWeek. Don't worry, back to cooking tomorrow! Link to my project notes on Ravelry here. I prefer one leaf over two. Link to the pattern here. The original source is no longer online, but the pattern is available via the "Wayback Machine" at this time. And the apple hits just keep on coming! 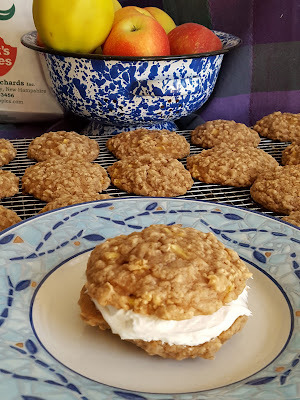 Today's recipe is Apple Oatmeal Cookies from Taste Of Home. I've made several versions of cake mix cookies, and we always enjoy them. No major changes to this one, except that I omitted the raisins because I didn't have any on hand. They'd be great with Spice cake mix and Craisins. They are good as is, but we took them over the top by sandwiching two of them together with some store bought cream cheese frosting that I added some cinnamon to. Thank you so much to Nicki W for sharing the recipe! 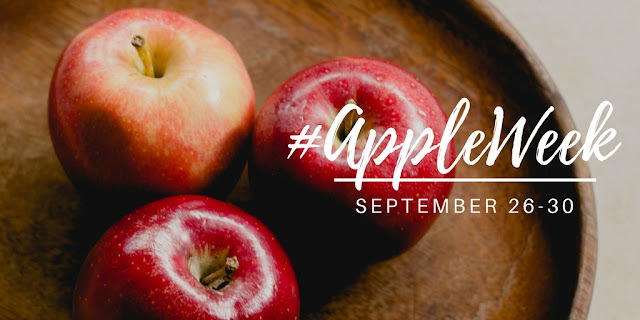 Be sure to go check out all the other great #AppleWeek recipes shared at the bottom of the post! It's Taste of Home Tuesday! This recipe came across my feed on Facebook and I knew it would be a fun thing to make with Jake. 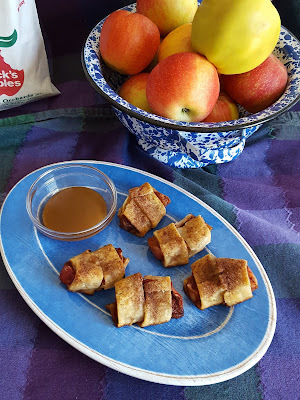 We used honeycrisp apples, and tossed the slices in the cinnamon sugar mixture rather than sprinkling it on the dough. We had them with a side of warmed caramel ice cream topping for dipping. Fast, fun, delicious. Thank you to the Taste of Home test kitchen for sharing this one. Be sure to go and visit my fellow Volunteer Field Editors pages via the links at the bottom of the page for more fantastic Taste Of Home recipes. Caramel Apple Floats- It's Apple Week! Welcome to #AppleWeek! All week I'll be featuring some great new apple recipes to celebrate my favorite season. Be sure to go check out the other amazing bloggers contributions linked at the bottom of the post. Who's ready for fall? It is hands down my favorite season- hoodies, apple picking, cider, the leaves changing colors. We've already made one trip to the orchard for honeycrisps, and some cider. I'll be swinging in this weekend for more goodies. This year, I'm participating in #AppleWeek and I'm so excited! I've got some great recipes lined up, plus one of my most requested knitting projects of all time. Be sure to check back on Monday for the first post, and to go check out all the great things the other participants are sharing! Spiced Ginger Coffee- My first Taste of Home Tuesday Recipe & Review! Fall is my favorite time of year. The leaves are changing, the mornings are cool and crisp. I love starting these days with a nice hot cup of coffee. I'm a huge ginger fan, especially combined with molasses. This reminds me of a gingerbread-style beverage I got from a chain restaurant around the holidays. I had mine with cream, because it was what I had on hand, but definitely will be picking up whipped cream for future servings. Because I'm the only coffee drinker, I froze about half the mixture in 2 teaspoon servings in an ice cube tray. When they were solid, I popped them out and put them into a ziptop bag. I'll defrost them for hot coffee use, or I may play around with them in an iced coffee version. Thanks so much to the hard working people at the Taste of Home Test Kitchen for sharing this recipe! I've been an avid fan of Taste of Home and the affiliated magazines since the 90s. My Gram was a subscriber, and she would share her issues with me. I became a subscriber myself sometime in college, and through the years have made over 125 recipes from those pages. In 2015, I was very excited to be chosen as a Volunteer Field Editor. I make and review recipes, submit original recipes, participate in social media. 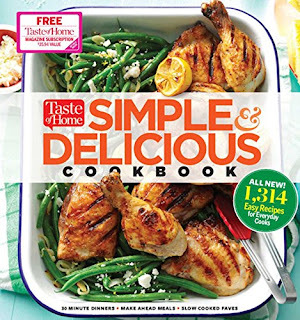 Part of the "perks" is the ability to preview cookbooks, and this recipe is from the Simple and Delicious Cookbook, which will be released today, September 13, 2016.